Lot A4-1-8, Solaris Dutamas, Jalan Dutamas 1, Kuala Lumpur 50480. Inside Publika from Ben's restaurant on your right, keep walking straight and cross the road. Go up the stairs or escalator to the 1st floor and turn right. 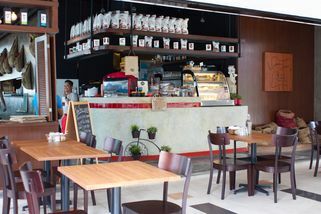 You will see Nathalie's right next to the escalator, walk past Nathalie's to the corner and Red Bean Bag is there. 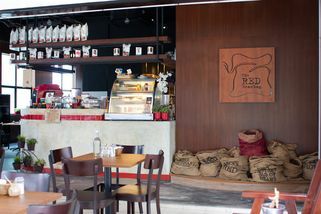 Red Beanbag is a beautifully furnished, cozy restaurant that’s aptly named after the bean bags that hand on the walls, filled to the brim and labelled accordingly with words like “play”, “freedom”, “passion”, and “wit”. Definitely a very inspiring restaurant to dine at. There are nice booth couch seats by the windows as well as regular dining tables. 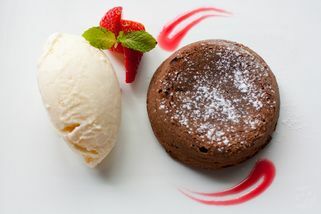 The food at Red Beanbag is primarily Western, with a touch of Italian and Australian. 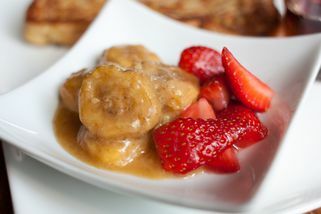 They are very popular for their breakfast menu, which includes favourites such as French toast (served with strawberries, bananas and maple syrup), eggs benedict, and big breakfast sets which feature sausages and bratwurst. The pasta at Red Beanbag is freshly handmade—none of the dried, store-bought pasta that most places utilize. The breakfasts are good and priced okay. You can't go wrong with anything based on eggs. The names on the menu will make you chuckle. 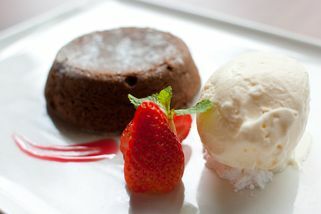 Their concept is interesting but it seems to be just one of many 'cool' joints popping up around KL. Same story - studied overseas, came back, opened restaurants like they went to overseas. Whether they've managed to pull it off is up to you to decide. My Crustacean Cousin (RM28.90) - My wife ordered this. I didn't enjoy it. The home-made tagliolini's texture was just not right not me. ShroomShroom (RM24.90) - Creamy mushroom and beef bacon on fettucine. This was OK but nothing I'd go back for. Latte (RM8.00) - Wife had it. Nothing great. Honestly, I really wanted to like this place, especially when I saw their breakfast menu. But the food and the price didn't match. I hope they can improve on this. I'll still give them a chance go back to try their breakfast menu one day. Hopefully it'll change my perception on them. "I like their French toast"
They know how to make French toast. It is thick, a little crispy outside and soft inside. They use good quality maple syrup. A for effort! they really tried their best to make it as aussie as possible, with the tim tam slam (never offered in OZ cafes but Oz none the less), their penchant for coffee, their limited menu and their artsy indie decor. 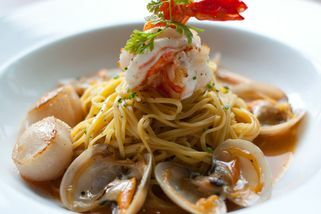 I had the seafood pasta, it was ok, was quite happy with the amount and tasteand style of my dish. Prices are also alright. However! I am a big coffee buff and even after all the hullaballo about the coffee here it was just MEHHH for me. Ive had better even in here in KL. But perhaps it was the barista's fault. I've been promising myself to pay a visit to The Red Beanbag at Publika as it's fast becoming one of the most popular brunch spots. Waking up really late (and hungover) one Sunday afternoon, few of us arrived there only to find out the breakfast was only served until 3pm. But not letting it dampen our spirits, we proceed to order anyway. I don't often order anything with seafood but for some reason the name of the dish "My Crustacean Cousin" had caught my attention. Seeing the pasta is made in house I was keen to try this out. Not only it's aesthetically pleasing, it's also one of the best pasta dish I've had in KL (granted, most of them don't even make their own pasta and often overcook too). The seafood was abundant and fresh. I especially loved the how they cooked the scallops just right and also the pipis were full of flavours. The only let down is that the Tiger prawns were slightly overcooked and I suspected they weren't the freshest. The pasta was also pleasantly flavoured (seafood, of course). For about RM28, it's definitely worth your money. The coffee here reminds me of Melbourne, which is no surprise since this whole cafe is inspired by Australia anyway. Perfect to lift up my mood! The service can be a little slow though when the place is busy. Hopefully that will improve as they continue to grow. We'll definitely be back here for the breakfast menu, can't wait to try out their Poached eggs with Salmon! "Eggs Atlantic V2.0 *thumbs up*"
I had Eggs Atlantic V2.0 last Sat - Poached Eggs With Hollandaise, Asparagus, Mushrooms & Smoked Salmon, With Two Pieces Of Fluffy French-Toasted Bread..looking at the portion, I thought it was too much..somehow I managed to finish it - guess it was too tasty :P .. This is a nice relaxing place to spend your morning, enjoy great breakfast while reading newspaper ...hmmmm ~ hav to be early tho, the crowd was crazy during the weekend ..
"French toast is the bomb!" The French toast here is the absolute BEST thing ever!!! 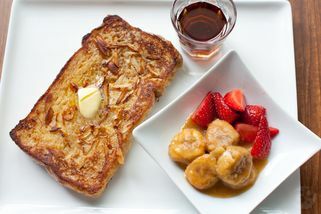 They put roasted almonds on the bread, and the toast is served with maple syrup and strawberries and bananas. Delicious. Tried the seafood pasta, which was also great, but the pasta was a bit soggy. Guess it's because it's freshly made, maybe? Tastes different from regular pasta for sure.